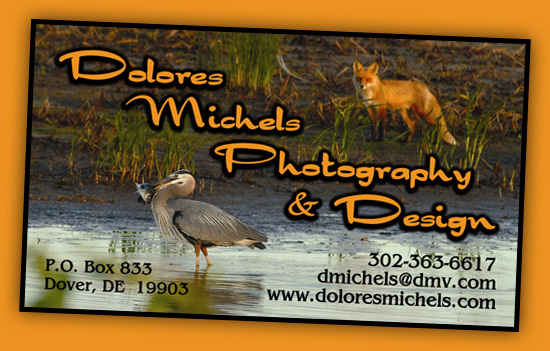 Dolores Michels has always had a passion for photography and design. Her love for nature and her ability to capture its true essence with enthusiasm and beauty is phenomenal. Whether it is a fine art print, portrait or product shot, her images are extremely captivating, each telling a story and projecting a strong emotion. You are invited to experience her creative vision. She has taken courses with Eddie Soloway, nature photographer, Michael Melford, National Geographic photographer, Bambi Cantrell, portrait photographer, Jerry Ghionis, wedding and portrait photographer and has attended the PhotoExpo in NYC for many years. Dolores has covered sporting events such as college and NFL football games, NASCAR, Grand-Am Rolex Sports Car Series, and American Motorcycle Association Pro Series. Dolores is a member of Delaware by Hand, Inc. and the Mispillion Art League.